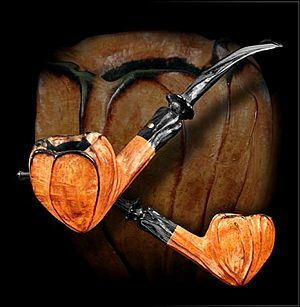 The following passage is written by David Wright in his book, The Pipe Companion. 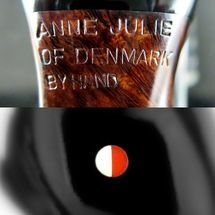 "Based in Laeso, Anne Julie is both a pipe maker and a painter. Her work is noted for its bold form, strong lines, and robust curves. 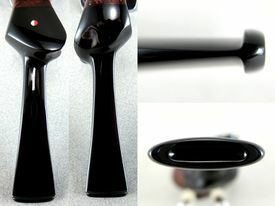 Today, she sells her highly sought after pipes in Denmark, Japan, Germany, and the United States. 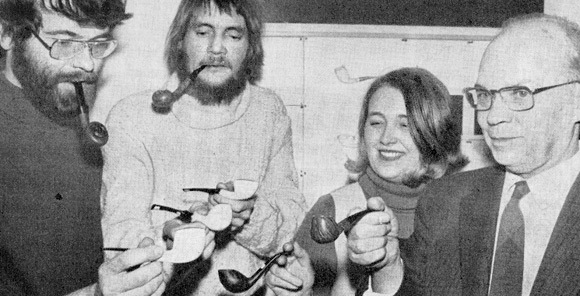 Anne Julie happened into pipe making through her husband, the renowned Danish pipe maker Poul Rasmussen. 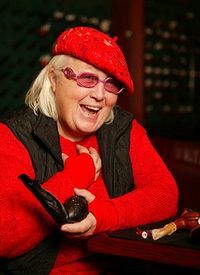 She had been married for only a short period of time when Rasmussen died suddenly at the age of forty-six from complications of a heart transplant. Only twenty-seven and with a two-year-old son, Julie was forced to make some hard decisions. At first, she planned to sell Rasmussen's carving machines and pipe inventory. While visiting the shop in Østerboro, however, she ran into one of her husbands former apprentices, Hans Nielson, known as "Former". Together, they looked through the shop and found some briar blocks. 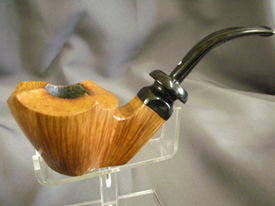 With Nielson's help Anne Julie began carving pipes. She notes that until then she never handled a pipe because her husband believed pipe manufacture was only men's work. Gradually, however, she "grasped the principle of surface area, the nature of wood, the individual log's innate shape, droughts of the year's seasons, shades, functionalism, etc.."
The Anne Julie pipes, marked by a single red and white dot, are made by hand. 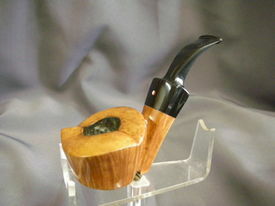 She uses a large grinding wheel to shape the pipes and stems. 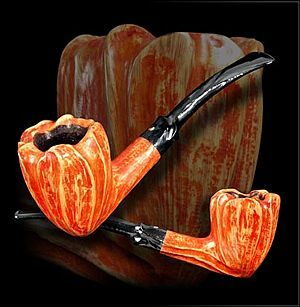 She finished most of her pipes in a ruby red and black stain and stamps them "Anne Julie"
Anne Julie pipes include both tradition shapes and expressive freehands. 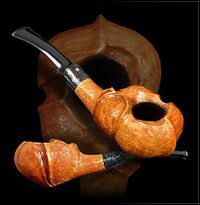 The traditional pipes are stunning, beautifully crafted, and large. The freehands exhibit bold forms, strong lines, and graceful curves. 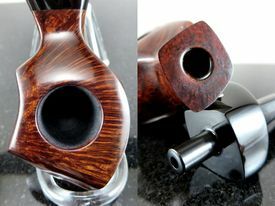 These pipes reflect Julie's philosophy of living life to the fullest. 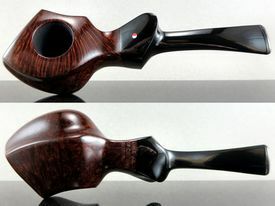 Some of the pipes have a feminine feel while others reflect the rugged, austere, and wind-swept climate of Northern Denmark. 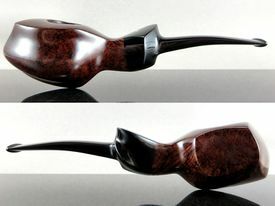 One of the most intriguing aspects of Anne Julie pipes is their metalwork. Julie is fond of using metal windcaps or plates of metal and bands on the pipes. Klans Bjerring Andersen does her silver work. 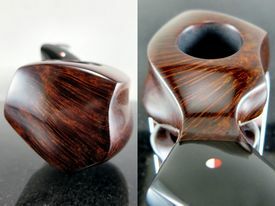 She also handworks the stems with contours, beads, and rings to accent the unique designs of her pipes. 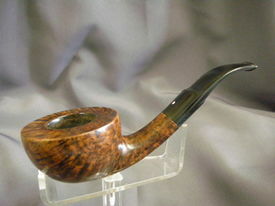 Anne Julie pipes are very much worth the effort to locate for firsthand inspection and purchase. 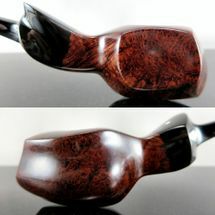 She produces a limited number of pipes annually.